Beckoned by the glittering choices of practical, efficient butane lighters, it's easy to overlook an old-school option that may not lead the technological forefront, but does produce a flame as clean as a cedar spill. In the eyes of purists, wooden matchsticks remain the gold standard for unadulterated tobacco consumption, without the introduction of flavor contaminants. And, done right, this basic combustion can provide a degree of elegance to your smoking experience. It may take a bit longer to light up with a match, but keep in mind that bundle of tobacco you're holding required several years of care and craftsmanship before arriving in your hands as a premium cigar—the least you can do is take a few extra moments to make sure it's properly lit. Don't confuse high-quality cigar matches with run-of-the-mill matchbooks found in convenience stores. You want matchsticks made of wood, not paper, that are at least 3 1/2 inches in length. Sulfur-free heads ensure that the match will not affect the flavor of your cigar. But don't get too caught up in the details, most brick-and-mortar shops give these types of matches away for free or provide them at a nominal cost. After striking the match, wait for the combustion chemicals to burn off and let the wood feed the flame before toasting the foot of your cigar. This provides the cleanest flame possible. Be patient: wood burns at a lower temperature than butane. It may take three matches to light a cigar. And precision counts. Occasionally you will have to tap the burnt end of the matchstick into the ashtray to keep the flame burning properly. For those who vouch for lighters as a matter of aesthetics, don't forget the Old World elegance of a luxury matchbox. 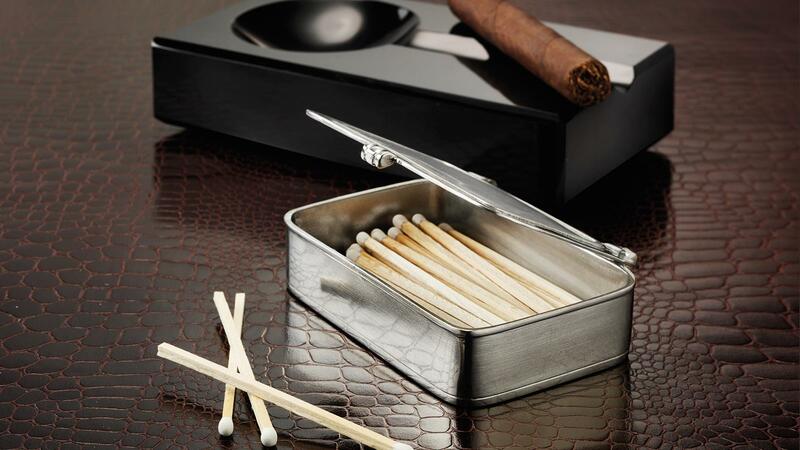 An Italian pewter box from Match ($160) complements any smoking room table. And—unlike some aforementioned lighting devices—you don't have to worry about losing it in between your couch cushions. When smoking outdoors or lighting up on a whim, matches are not always a feasible option. But the next time you're afforded the luxury of time, take a moment and slowly toast the foot of your cigar with a long wooden match. Allow the crackling wood and the aroma of premium tobacco to be absorbed by your senses. It might just remind you why you're having that cigar in the first place: to slow things down and relax.